Shower Panels are a feature-packed alternative to the traditional shower head. Massaging jets, rainfall and waterfall style showers, and handheld sprayers are all common features with shower panels or “shower spas”. The obvious question you may have is how much work will have to be done to get one of these installed? Well, it depends. There are models that are simple drop-in replacements of your current shower head, or some that require more effort. If you’re doing a remodel or a newly built home then you will have a much easier time since there’s no need to tear out existing tile or plumbing. Below you’ll find our top picks for shower panels and we’ve noted the easily installed models. Primarily, the Jet Pro Shower Spas are the easiest drop-in replacement for your shower head. For these it’s almost as simple as hanging a picture, you just have to hook up the water lines and install the mounting brackets. Keep that in mind when comparing cost with the other types of shower panels here. If you need to hire a plumber it can become more expensive than the sticker price. A shower panel that you install yourself is not going to cost much more than a traditional shower head. There are panels available at wide range of prices, and even basic models have a huge selection of features and spray options that you will love. No matter what type of décor you have in your bathroom, there is a full body shower panel that can accommodate your style. There are plenty of finish options to choose from. In fact, some models even have spouts that you can use if you want to install the panel over a bathtub. You aren’t limited to using these in a walk-in shower! Occasionaly, in product reviews, you will see complaints that a shower panel is poorly packaged and arrived damaged with dents. If you’re in the middle of a home renovation and purchase a shower panel, from any manufacturer, don’t let it sit past the return date before inspecting it. You definitely want to avoid having a damaged product you’re stuck with that could have been avoided. Licensed Plumber recommended and this type of shower panel completely replaces your existing valves and fixtures. This Perfetto shower panel wins over the Decor Star model below because it has more jets and is reasonably priced. All features can be used at the same time. The water jets are angle adjustable. This is an all-around great and affordable upgrade for your shower. The Perfetto shower panel’s height of 65″ combined with the spacing of the 8 jets gives you a lot of freedom for position it for people of all heights. It’s recommended to have about 10″ to 12″ of clearance between your head and the rainfall shower head. All functions can be used simultaneously. This shower panel uses separate connections for hot and cold water and will completely replace your existing shower fixtures and valves. You may need to consult a professional plumber for installation. Although, a knowledgeable DIYer might be able to accomplish the installation. Easily installed with existing mixing valve and is nearly as simple as hanging a picture. The great thing about these Jet Pro models is that you can use your existing mixing valve and simply replace your shower head. Since this unit isn’t very tall you won’t get complete body coverage from the jets, but being able to angle the large center jet helps compensate for this. The convenience of the Jet Pro can’t be understated. It’s the simplest way of adding on jet sprays, handheld sprayer, and a rainfall shower head to your existing shower with little work. The tall stainless steel shower panels look more impressive, but at the end of the day you’re not getting a huge improvement function-wise over the simple Jet Pro models. With that said, you might notice a price difference between the two. However, if you have to hire a plumber for the installation of the full-size shower panel then that savings disappears quickly. The body massage jets cover a large area and can be used simultaneously with all other functions on the shower panel, this isn’t possible with some shower panels. The waterfall feature is a nice change from the usually soft showers we’re used to. While calling the jet’s spray a “massage” is generous, it certainly is satisfying. For the Decor Star, there are 4 independently controlled shower functions that can be used individually or with any combination of the others. The built-in handheld really makes this a complete package, and it’s especially useful for washing pets. The shower panel outer material is stainless steel. The handheld is made from brass with a stainless steel hose. The faucet material is brass. While these materials are corrosion resistant, being in constant contact with water can still cause corrosion (even on some stainless steel). Keeping the shower panel clean and dry with stainless steel cleaner can prevent corrosion and extend the life of the shower panel. Important Note: There is some question about the certifications some of these models have, primarily the AKDY models, and whether or not they may be installed in some states. There are certain requirements for getting a permit for installation of any new plumbing where it did not exist before. This is entirely dependent on where you live. It’s a good idea to talk to a plumber or someone familiar with the building codes in your area. You can expect better quality construction and materials from the more well-known brands such as Hansgrohe or Aston. However, you will notice a price difference. Here’s a quick list of a few more shower panels that we reviewed below. The 6 jets, rainfall and waterfall showers, and handheld is similar to the other models we recommended above. You can use all functions on the shower panel at the same time. The handheld on this model is rather small, and if you are installing this shower panel over a tub you can consider leaving the handheld off and you will be able to use the bottom water outlet as a way to fill the tub. This pH7 shower panel is slightly larger than the AKDY above and has similar features. AKDY is a more familiar brand, but both the pH7 and AKDY models are made in China. The standard connections on this shower panel are 3/4″, so you will need to adapt to the 1/2″ NPT fittings you likely have in your home. This is fairly common with shower panels. Shower extends 18.3″ from wall. This shower panel by Ello & Allo has a slight twist on the mix of features we’ve seen so far. You get an LED temperature display and 4 jets in total, but there are two large circular jets with the option of a focused spray or moer gentle mist. Unfortunately, the LEDs are powered by batteries that you will have to replace. The ability to use all features simultaneously sounds nice in theory, but usually in practice there simply isn’t enough water pressure to satisfy the needs of every function. With this shower panel, you can use 2 functions at the same time. This is a more realistic expectation. Also, the handheld water connection is not on the bottom of the panel, which has made space for a water spout that could be used to clean your feet or fill a tub. Having the handheld connection in the middle of the panel means you get a higher reach and more convenient placement of the hose. This shower panel by Hansgrohe is made in Germany, which is a nice alternative to the mostly “Made in China” shower panels. You will notice a significant price increase. We also recommend checking out the more recent Hansgrohe Raindance shower panels. Shower extends about 19″ from the wall. Aston has some very attractive and excellent quality shower panels. This model needs minimal assembly and comes with the hot and cold water hoses you will need. The connection required is 3/8″ male with compression threads. It’s recommended this shower panel is installed by a licensed plumber. Aston is a brand headquartered in Texas, so if you’re looking to buy products from a company based in the USA then this is a good choice. Having US based customer support is a plus. This model by Dreamline is less bulky than any of the other models we’ve looked at. 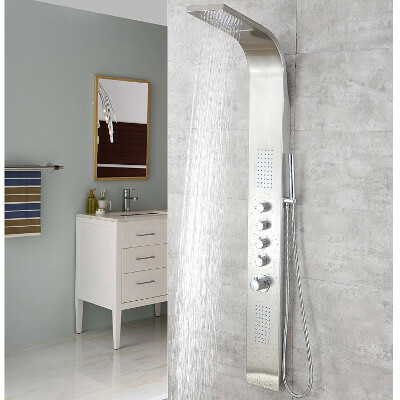 Feature-wise it has 6 jets with a rainfall shower head and handheld. Customer support appears to be excellent with US-based service. Optionally you can install this shower panel in a corner using the corner mounting bracket. So what is normal water pressure in a home? About 75 psi is considered normal. You may find your home’s water pressure is much higher, which can be good and bad. If you measure 100-150 psi, then that means your plumbing is under a lot of strain and can cause issues. Installing a pressure regulator is recommended, but check with a plumber! If you happen to have water pressure issues, you can set most panels so that the overhead feature pauses when you use the handheld or other jets on the shower panel. Don’t forget to turn off the water before beginning. Make sure the brackets are level before you drill the holes to install panel as well as after they are screwed in place. Make sure that you connect the hot and the cold water to the right location. When you drill the holes for the brackets, make sure to drill through plumbers tape so that you do not damage the tile or surface that you are attaching the panel. Make sure to measure and mark the top, center, and bottom of the panel before beginning installation. Always use wall anchors to ensure that the installation is secure. Make sure to accommodate for the height of your family members. Often, the instructions for installation can be a bit confusing. Here is an installation video that you might find useful as well.